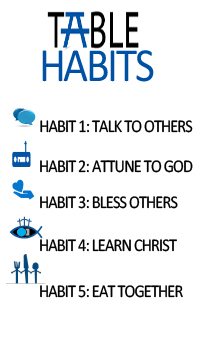 Developing personal, community and spiritual habits is one helpful way to grow and mature as Christians. Over the past few years we have developed the habit of having “Breaking Bread Sundays” once a month; a time when we come together to celebrate Jesus’ life, death and resurrection around the Lord’s Supper and then enjoy fellowship after each service. During 2016 we will continue to gather around the communion table on the 1st Sunday of each month. Since the early church this has been an significant and symbolic occasion to remember the Gospel message and recommit ourselves, personally and corporately Jesus. Every second month we will gather together after the services in a large morning tea, lunch or dinner. On alternate months in 2016 we will also continue meeting together in smaller groups called TABLE groups. We hope that people will join a TABLE group, especially if they are not already in a small group or other regular ministry group. TABLE groups may be integrated within existing social networks/groups in the congregation or be formed just for the year – it is up to you! You may want to continue an existing group, invite others to join or start a whole new group! These groups will provide a social connection throughout the year AND also be a place where you will encourage each other to develop habits that will help us meet the year’s vision and also our broader MacChap Vision.